This National Book Award finalist by Peter Carey is, according to the front flap, “an improvisation on the life of Alexis de Tocqueville.” I don’t know a thing about de Tocqueville, and I’m not all that curious about him, and this book did nothing to change that. However, my ignorance about the book’s inspiration didn’t particularly hinder my enjoyment of this book. 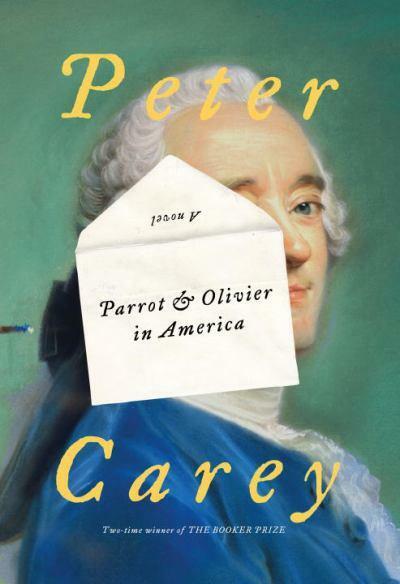 de Tocqueville may be the inspiration for Olivier, one of the two main characters and narrators, but Carey seems to merely use his life as a jumping-off point from which he builds a new character who, along with his servant Parrot, enables Carey to explore the early years of American democracy. When the novel begins, Olivier’s family has left its Paris home and moved to a château to escape the forces of the Revolution. They dream of returning to Paris and taking up prominent roles in the government and at court when the king comes back to power. Things do not turn out as expected, however, and eventually the family decides that Olivier should leave France for America, ostensibly to write a book, but really to get away from the violence in 1830s Paris. The second narrator, Parrot, meanwhile, is working as a printer’s devil in England. His duties include smuggling food and supplies to a printer who is creating secret documents in a hidden room in his employers’ home. Eventually, the whole operation goes up in flames, and Parrot ends up on a ship to Australia. Years later, he turns up again in Paris and is ordered by his employer to accompany Olivier to America. And so we have Parrot and Olivier in America. I thought the Dutch captain exceedingly civil. He received me in his cabin with great solicitude and sympathy, and had I not accepted his brandy I doubt I would be where I am now—that is, far at sea without hope of return, surrounded by the most appalling bourgeoisie and worse, this servant you have provided, with his wretched cocky walk and his mouth always on the edge of the most horrid smirk. It would be better for me to have stayed in Paris, I would prefer being pulled to pieces by the mob. This captain of the Havre was as hard and scrawny as a piece of rope. He had rheumy squinting eyes, a tobacco-stained mustache, a rum drinker’s nose, and absolutely no arse at all. Both of these passages reveal something of the man behind the commentary—what they take note of, what they don’t, and how they perceive class. Through the book, all of these ideas remain undercurrents. We see each of the two men react differently to people of different stations, and we see them both struggle to make sense of a country where class exists, but in which the strict delineations between classes are not what they were in Europe. The rules for dealing with others are different, and both men must figure out what place, if any, they can have in this society. Most of the time, these themes remain an undercurrent, rarely mentioned explicitly. Instead, we see Parrot and Olivier meeting different people and watching how those people work the system. We also see the two men grow and change in their understanding of each other. The trouble is that it’s not always easy to tell what Carey is getting at, or if he’s getting at anything at all. There are bits that seem to echo modern insurance fraud, the banking system, and the electoral process, but these bits aren’t developed much. I love that Carey doesn’t just have his characters spout ideology throughout the book, but I think the subtext was buried a bit too deeply. It’s only in the final pages that I felt I could see what questions Carey most interested in. However, Carey had to spell it out before I could be sure. And even when he does spell it out, the last two pages, and the final dedication, make me wonder just which side of the argument Carey is on. I like the ambiguity here, but not the burying of a primary theme. The fuzzy, meandering quality also applies to the plot. The characters travel around America, sometimes together and sometimes separately, sometimes living with other friends or lovers, and usually just taking events as they come. The directionlessness of the characters makes the plot feel directionless. I wanted it to get somewhere already, but it wasn’t getting anywhere, and there didn’t seem to be a clear destination anyway. Still, there are plenty of joys to be had in this book. It was great fun to watch these two enemies become allies and even friends over the course of the book. I laughed at several of the scenes in which Olivier dictates his letters to Parrot, sometimes commenting on his dissatisfaction with Parrot, while Parrot inserts a few comments of his own into the letter. I also enjoyed Olivier’s courtship of the Miss Amelia Godfroy and what its outcome says about how Americans and Europeans may view one another. And I simply must say a word the presentation of the book. I really disliked the look of this cover—until I saw the actual book. It has a beautiful matte finish with lettering in gold leaf, and the back shows a bit of an important scene from the book. Plus, there are deckle edges! It really is a gorgeous book, even if the picture on the cover is not. As for the National Book Award race, I liked Great House much more than I did this. There’s plenty to praise here, and I’ll definitely read more Carey in the future, but he simply didn’t pull me in the way Krauss did in Great House. So my vote at this point is still for Krauss. I wasn’t a fan of Parrot and Olivier – I couldn’t cope with the meandering plot. I enjoyed Oscar and Lucinda a lot more and I think you will too. He takes that beautiful writing and adds a grpping plot to it. You are persuading me read Great House though! Oscar and Lucinda is the Carey book that I happen to own. I loved the movie and am looking forward to the book. I’ll be interested to see how you get on the Great House. I loved it, but it’s not got much in the way of plot. It was the writing and the characterization that swept me away. I managed four pages of this before giving up out of sheer boredom; I don’t think Carey is for me but I’m content with the fact that not all authors can be. Glad you had better luck and the edition does sound beautiful! Yep, there are plenty of acclaimed writers that I don’t think are for me. No writer can be for everybody. I’ve heard more consistent praise for Oscar and Lucinda (which will be my next Carey) and True History of the Kelly Gang. I’m interested in both of those, although if I end up not liking Oscar and Lucinda, that may be where I stop. I like to give authors a couple of chances, but not more than that. I loved Oscar and Lucinda but for some reason have struggled to get around to reading more Peter Carey. I was very interested in your review as this is the kind of book I am likely to pick up and put down several times in a bookstore, feeling uncertain about it. I have heard of Alexis de Tocqueville but I don’t think that’s going to help me out exactly. Definitely one to only acquire as a cheap copy, I feel! Good to hear another positive opinion on Oscar and Lucinda! I bought a copy earlier this year and will read it one of these days. I’ll probably read this as I have a huge Carey crush and a passing familiarity with de Tocqueville (studied him in college). The voices of the characters really were wonderful! That’s what kept me reading, even when the plot didn’t. And tt does sound like you may just be the right reader for this book. I understand that Carey actually draws in bits of de Tocqueville’s own writing, so you’d probably have fun picking those out. Ah, de Tocqueville. One of the most quoted and often willfully misinterpreted writers in American discourse. If you want to read a really interesting Carey book, you should look toward Edward Carey. His two books Observatory Mansions and Alva and Irva are fascinating reads. Peter Carey I can take or leave. I’m going to give Peter Carey another chance because the writing was so good in many ways, but I’ll also look into Edward Carey! As a Dickens junkie, I had to read Carey’s “Jack Maggs,” the story of “Great Expectations” told from Magwitch’s point of view, and a more modern, more cynical sensibility. It’s pretty whacked out, but entertaining. Let’s just say that the Pip that Magwitch (here Mr. Maggs) discovers on returning to England is not the Pip you might imagine. A must-read for any Carey or Dickens devotees. That does sound interesting. Great Expectations is one of the two Dickens novels I actually enjoyed. I’d love to see it from Magwitch’s point of view. Your review has led me to believe this book may not be as bad as I initially thought. I still have no desire to ever read another book by Carey though! It’s a mixed bag, for sure, but I did like the writing a lot–enough to want to read more Carey. I’ve not read Carey before but he is on my list as is this book so I am glad you liked it in spite of a few flaws. I did like a lot of it quite well. Some of his other books interest more than this did, so I’m optimistic about his other works. Thank you the detailed review. I have a far better picture of the book than I did before. I’ve also read it recently and it became on the few 2010 “I quit”. I just couldn’t get into it and everything was made worst because I really was really to love it. I know of other people who couldn’t get into it. The writing was just clever enough to keep me from wanting to put it down, but I didn’t end up loving it.